How did you score Dustin-Max 2? Discussion in 'Cageside - MMA Discussion' started by conor mcgregor nut hugger, Apr 14, 2019 at 12:35 AM. 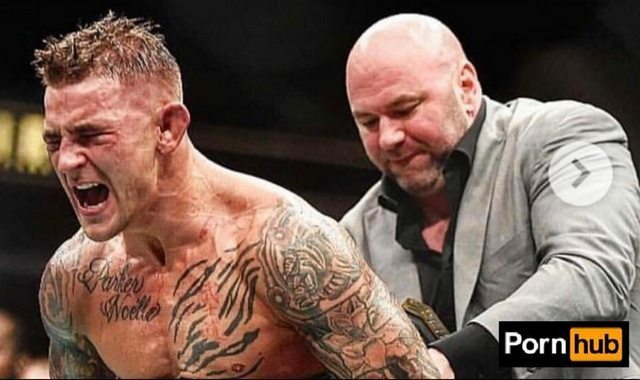 Who won the Dustin Poirier vs Max Holloway rematch at UFC 236? I had it 48-47 for Max but I understand why someone would think that Dustin won round 4. You are welcome to disagree with me, but you're wrong. Unfortunately I think Khabib dominates Dustin. The only one capable of beating Khabib is Conor with two healthy feet. Even the second round could have went to Max. After the first, Dustin's output slowed and Max's increased a ton. Dustin was able to land some big shots though that obviously won him rounds in the eyes of the judges. The knee that split Max open in the 4th would be a good example. How did Poirier win round 5? It was close but I thought he landed a few heavier shots and Controlled the majority of the round . Didn’t all 3 judges give him 5 too? Or did they all give Poirier a 10-8 first? It was close but I thought he landed a few heavier shots. Didn’t all 3 judges give him 5 too? Or did they all give Poirier a 10-8 first? Haven't seen the scorecard for that fight yet. But I didn't like the stalling he did at the end of the round. I'd have to go back and watch the first 4 minutes but I don't remember him landing any big shots in that round. I had it 48-47 Poirier. 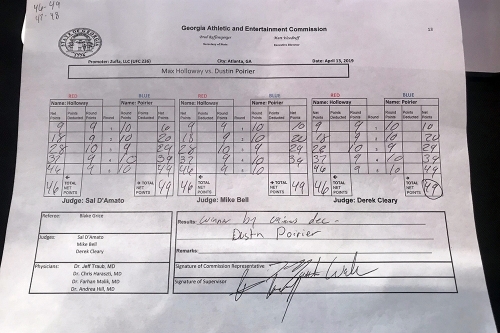 I seriously dont see how Poirier won the 5th, Max was active all round landing shots whilst Poirier had like 1minute of stalling at the end. The 4th round was close but Poirier did the most damage. The thing here is... what criteria do you use to score that round? Here we have a volume striker vs a hard hitting striker... for me Poirier was the one landing the more cleaner shots especially since Holloway just stopped trying to block some shots like that true savage he is and Holloway landed more shots. If u also take in consideration that Holloways face looked like it had taken alot more damage. I feel like we the fans often take into consideration to what fighters press the action and moves forward, im all for different strategies as long as we see some action and if we dont the ref should be more active to make the fighters engage with point reduction threat. But the last 2 fights didnt have a single round were the criteria octagon control got into play, there was too much action happening. We had examples earlier on this card with the Jouban vs Grant fight. Jouban didnt throw enough didnt cut off Grant and when exchanges happend a more or less one armed Grant actually got the better of those exchanges most of the time. So i would say it was Joubans own fault he lost, he should have tried to change something during the fight and atleast try to throw more, cut off the angles more and kicked to the body more. The fact is when u face an opponent that has good movement and cardio and ur best parts of the game are in striking then u need to use strategies to lure him in and counter, thats smart strategy. Im actully emberassed to use this as an example but look at Khalil tonight.. he used good strategy to pull off a victory against Anders thats so tough he probably would have won on his toughness if Khalil would have fought like he used to do. So after this little rant i would like to say i scored Holloway vs Poirier... 48-47 to Poirier. I had it 49-46, but admittedly a couple rounds could have gone either way. In those types of situations I default to Pride scoring. With that in mind I don’t care about the scores, just that it was definitely the right decision. Had it 48-47 Holloway personally, but probably just because I was rooting for him. But I totally understand how some of you scored it otherwise. I realize the numbers don't tell the whole story but they tell part of it. There's not much separating these fighters. An interesting fact to remember is that Dustin already held a submission win over Max so a trilogy loses some interest because Dustin already has two victories. But I think Max is capable of beating him on a good night. I had Poirier 1,2, Holloway 3,4 and 5 was a toss up, but I felt Poirier controlled a little more of it with lame cage pressure. You judge as well as the actual judges. At least Dustin didn't get screwed, or did he? Like my wife has been saying, we never want to see Max lose but we’re also happy he didn’t win and muddy up an already complicated division. At least he made it a good showing even though he was outgunned from the start. Dustin looked huge standing next to Max so if he wants to go up to 155 he needs to take some time and bulk up a bit before he thinks about going back against those killers.